Brad Allen admitted a bit of a bittersweet feeling after winning his second world duck calling championship. More sweet than bitter, however. Allen claimed his second title in three years on Nov. 24 at the 77th annual World’s Championship Duck Calling Contest during the Wings over the Prairie Festival in Stuttgart, Ark. But in doing so, he had to defeat his closest friend in the sport -- fellow Arkansan David St. John of Conway. “David is one of my very best friends in calling,” said Allen, of Judsonia, Ark. “For many years, he and I used to travel together, going down the road to all of the regionals when we were trying to qualify for the world championships. St. John and Allen were at the top of the leaderboard throughout the competition, with Allen pulling away in the third and final round. St. John was the first runner-up, followed by Rob Bevins of Belle Blaine, Iowa, Jonathan Morton of Trumann, Ark., Brent Calhoun of Griffithville, Ark., Mike Benjamin of St. Cloud, Minn., and Tyler Merritt of El Paso, Ark. Allen, 39, who won his first world title in 2010 and finished third in 2011, won a prize package worth about $20,000, including $8,000, an extra $1,000 from his call manufacturer, Rich-N-Tone Duck Calls, a War Eagle boat, decoys and other items. Allen began competitive calling after earning a graduate degree in physical therapy from the University of Central Arkansas in 1998, and this year was the 12th time he has reached the world championships. He said like in any other competition or sport, simply feeling like you are operating at a high level can be a boost. 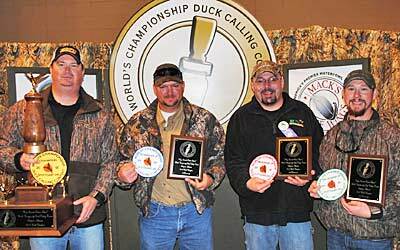 Only six callers have won three world titles: John Stephens of Stuttgart, Ark. (1995, 1998, 2005), Barnie Calef of Cedar Rapids, Iowa (1989, 1999, 2000), Trey Crawford of Jacksonville, Ark. (1976, 1986, 1993), Mike McLemore of Huntingdon, Tenn. (1973, 1974, 1977), Edward Holt of North Little Rock, Ark. (1968, 1969, 1970) and J.E. (Jake) Gartner of Stuttgart (1947, 1948, 1949). Allen said he will return next year to attempt to add his name to that list. For video of last year's crowning of World's Championship winner, click here.